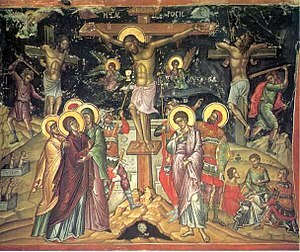 Today is Good Friday, the day Christians remember the crucifixion of Jesus. It is, and rightfully so, a tough day theologically speaking. It’s not a pleasant story we tell today. My annual Good Friday question is always, “why?” Why, of all the possible ways for God to set the world right, to defeat sin and evil, why this way? Now, I’ve been to seminary. I know the various atonement theories. I know the theological concepts of God suffering with and for us. I know all that. I can give you all the scholarly reasons. But every year, I still wonder, why this way? Of all the ways to deal with human brokenness and sin, of all the ways to defeat death and evil, why this way? None of the answers really, fully answer my question. They are just incomplete, something is missing. But the incompleteness isn’t on God’s “side” of things, it’s on my side. Every Good Friday I encounter the mystery of God. Mystery, for people of faith, does not mean a puzzle to be solved. The mystery of God is not a problem that will be solved if I just think harder about it, just study more, simply apply myself to the task . Rather this mystery has to do with the peculiar, odd ways of God. God is not entirely knowable. God is not completely understandable. I can know and understand some things. I can know some things about the death of Jesus, and his resurrection and what that means. But I don’t know everything. I don’t completely understand. My insufficient understanding points out the limits of my abilities, the limits of my knowing. Part of my unease on Good Friday is because I don’t like contemplating my limits, and not just my limits, humanities limits. Good Friday is not a time to think logically about the crucifixion, as important as that is. Good Friday is a time to enter into the mystery of God, the mystery of the Incarnation, the mystery of salvation. Good Friday is a time to reflect on the terrible evil that is in the world and the lengths God is willing to go to save us. The good thing about Good Friday is that it is not the end. Despite all the appearances, it is not the end. Easter follows Good Friday. God startlingly and unexpectedly present with us. That my friends is good news. slightly edited repost from 2010. Posted in Christianity, God, Jesus. Tagged Good Friday, mystery, mystery of faith. Nice post. But, I guess where I have come to in wrestling with this issue is simply that the idea of substituionary atonement is simply an incorrect understanding. I have come to see it as more of a reconciliation and restorative act. But, as you say, the apophatic way is the only way we can deal with what is really happening on Good Friday. May it be a blessed one. The more I think about these things, the more convinced I am that there is no “one” answer. What God is doing through the crucifixion, the resurrection, the sacraments, and the church is complex, multifaceted and more than we can imagine. Thank you for reading and commenting, I appreciate it.